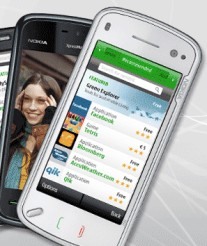 Nokia has begun rolling out its new app store – the Ovi Store – for both S60 and S40-powered handsets. It’s already available in Australia and a growing list of other countries. No UK or US availability — yet, however. I’ll update this post when and if that changes. Update: the Ovi Store has launched in the UK and US now, although the service is slow and unreliable as Nokia, presumably, attempts to scale it live. Hopefully this will be sorted in the next day or so. It’s early days but not the best of starts. For those countries where the Ovi Store is already available, users need to navigate to the now legacy Download! app and refresh for new content. The Ovi Store app can then be found in the “Nokia Extras” folder or “Promo” folder, depending on handset and region.